It's Pep Rally week and we are here today to share a sampling of the NEW Paper Smooches December release with you! FOUR new stamps and EIGHT new dies will be available to purchase on November 30th at 8:00pm pacific time. Once our release goes live, you will find our new products HERE. Deadline: You have until midnight PT on Sunday, November 30th to leave a comment. Please check the Paper Smooches blog on Monday, December 1st to see if you are one of the FOUR lucky winners. Now to my card:) I'm using the new word die set called Love and Cherish! I love the beautiful curl of this font and I thought it would pair nicely with the Blossoming Buds stamp set. The stamped flowers are pretty intricate, so I used a vellum overlay to prevent the card from getting too busy. On top of the vellum, I added the die cut sentiment and some enamel dots. The enamel dots serve 2 purposes, decorative (of course) and functional (they hide adhesive that keeps the vellum laying down). I colored the die cut word with some blended ink in 2 colors (pink and red). I also put a plain white version of the word behind (slightly offset). Both the blended ink and the white "shadow" really give the sentiment some depth and help the sentiment stand out. Now it's time for you to hop on over to the next stop on the hop, my talented buddy Jocelyn Olson! Keep on hopping! So beautiful, JJ! I love how the enamel dots and the sentiment pop on the subtle vellum! Gorgeous! Love the soft pastels. Love the softness you get when you use vellum. Very pretty! Perfect sentiment for this soft floral. Pretty! Your card is beautiful! Love the soft elements on it. Beautiful card! Love the "layering" for the die cut - great idea! Beautiful!! I love how you colored the die word "cherish". It looks amazing! Such a pretty cards and one of my favorite sentiments. Very soft and pretty with the velum. I like the shadow you created for the die cut word. Beautiful card! Love the sentiment die! What a pretty card!! I love that sentiment die!! What a sweet beautiful card, love the colors! Great use of the word die set! I love the way you offset it with the flower stamps. This is a great card - love the font. Love the soft pretty style. The use of vellum to soften the look is brilliant! Like the pretty background & how the sentiment pops out front & center. Beautifully colored - both the floral images and the "cherish." I love the softened look with the vellum. This is one of my favorite PS floral sets as one can do so many different things with it. I hope you had a really wonderful Thanksgiving Day with your family ~ Hugs to you! I'm all about flower stamps, especially the dramatic coloring you did. What a beautiful card! I love the use of vellum over the flowers and the use if the diecut is just exquisite. Thanks for sharing your creativity and inspiration. Great card. thank you for it. The vellum really makes this card so lovely. Oh wow! This is gorgeous! The vellum really makes the stacked die sentiment pop! It's such a beautiful look! Wow! Very lovely, and I really like how you colored the sentiment. Thanks for sharing! Cute card! I love your use of vellum. Love the tip of hiding the glue under the enamel dots! Your flowers are beautiful - and the vellum overly a great look! Great idea with the vellum! OH my! I am so excited for those dies! Fabulous card! Love the vellum over the flowers. Gives that soft touch!!!! Beautiful card! The vellum overlay is so pretty and these flowers are beautiful! I am starting to become a huge fan of these die cuts, especially the words. Love your card, very nice! I like the vellum overlay to soften a bold image. Nice! The shading on the sentiment is pretty and subtle! So pretty! 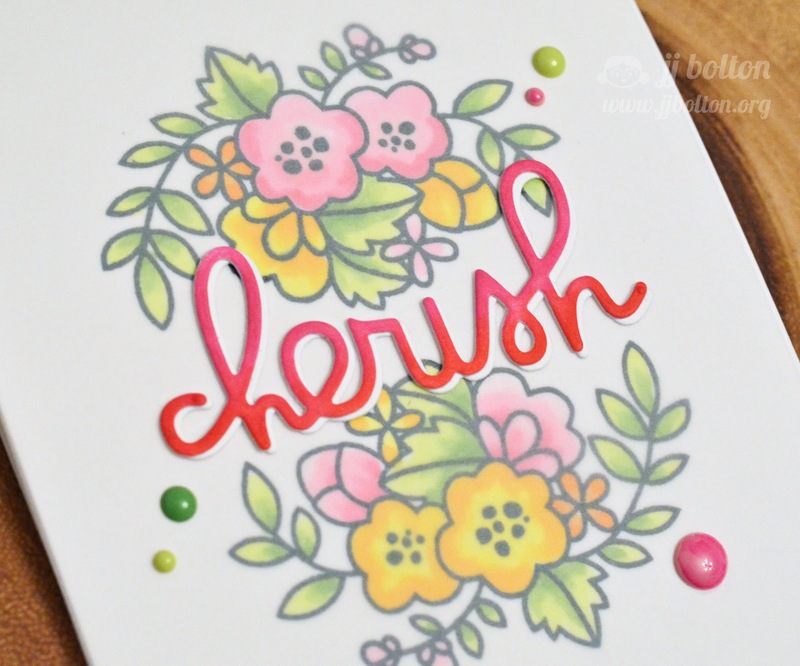 I love how the vellum softens the flowers and I'm in love with those new sentiment dies! What a pretty card! Love the two-tone sentiment and the vellum. That is stunning! Who would love to get that card!!?! I really love the use of the vellum on your card ! A pretty, spring-like card. The enamel dots really make it pop. I'm ready for a cheery spring card & yours is just perfect. Love the font on the die & the use of vellum. Great card! beautiful colors and combination. Great card. Beautiful card! I love the subtle look you got with the vellum, and the enamel dots add the perfect touch. Thank you for the inspiration. LOVE the sentiment and LOVE how your CLEVER vellum layer made the flowers look even more DELICATE - LOVE IT ALL!!! I super love this JJ! so pretty how you added the vellum and the word die on top! Absolutely beautiful! Thank you for the inspiration! The colors are amazing on this card! So pretty JJ - love those colours! Love the diecut sentiment and the colored stamping so fun! PS word dies are my fav! Beautiful card! I love the flowers and the sentiment. Very clever use of vellum. I Facebooked about your blog hop. Beautiful! I love the vellum overlay to soften everything. Just beautiful! The vellum overlay was the perfect way to soften everything up! LOVE!!! Beautiful card! Love the vellum background. Just stunning, love the addition of the vellum!!! Beautiful card! Love the soft look from the vellum layer and that awesome word die! Your card is so sweet! I love the sentiment... pops right off the card! This is so soft and pretty and I love the sentiment, shadowed with white--adds to the whole effect (vs a darker colour). Lovely! the colors are so soft and pretty. A relief from all of the Christmas cards. beautifully done, love the ombre of the sentiment! Love how the vellum softens the image! What a beautiful card! I love the bright colors and the flowers. Thanks for sharing. This is a gorgeous card! Love the vellum! So pretty!! I love the flowers and vellum. LOVE the Happy Birthday and the Cherish cards!